Use the guide on this page to learn how to access the CoMed job application online (via the company’s careers website). Several different types of careers can be searched/applied for including engineering, maintenance, operations, finance/accounting, distribution, and IT positions. Learn more about the company’s online hiring process in the below guide. About the Company: Commonwealth Edison (otherwise referred to as CoMed) is an American utility service provider based out of Chicago, Illinois. The company was created in 1907 and is currently a subsidiary of the Exelon Corporation. 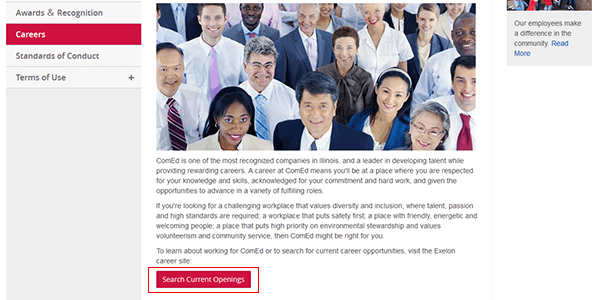 Step 1 – Use this link to open the CoMed careers site in a new browser window/tab. Step 2 – Scroll down the page and press the “Search Current Openings” button/link (as shown in the below screenshot). Step 3 – Click the “Search Exelon Jobs” button to go to the main job search page. Step 4 – Select “CoMed” under the “Organization” option (in the menu on the left side of the page). The results will automatically update to show current openings at CoMed. Step 5 – Click the link/title of the position that you want to apply for. Step 6 – Review the job description and then click the “Apply” button to go to the next step of the process. Step 7 – Read the privacy agreement and then press the “I Accept” button. Step 8 – Log in to your account. If you need to create a new account press the “New User” button. Step 10 – Upload/import your resume.